This is an unusual book, but one that you would enjoy. 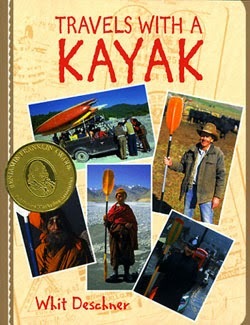 As far as the paddling is concerned, the author writes about his whitewater trips around the world. The locations span 30 years of international paddling and sound like at least a semester of geography---Nepal, India, Indonesia, Pakistan, Turkey, Great Britain, Alaska, the Everglades, and on and on. The writing style is back-handed, tongue-in-cheek, humorous. He strikes me as someone with a life-long subscription to Mad Magazine and with Saturday Night Live programmed on DVR. His facts are humorous, his humor is---ah, nope, the reverse won’t work. He has imaginary conversations with people long dead, and some with people that never lived. In short, the author could keep you simultaneously enlightened and entertained around a campfire anywhere. The book will do the same thing without you having to spend years dragging bags through airports.